China is the world's most enthusiastic smoking nation, home to one in three of the world's smokers. But, starting yesterday, smokers are out on the street as part of a campaign to improve the urban environment ahead of the Games. Athletes and visitors to the Games can at least be sure of a smoke-free environment during the event after officials in Beijing introduced a ban on smoking in public areas. There is absolutely no smoking in schools, hospitals or government offices, as well as at all 37 Olympic sites, including indoor and outside stadiums, training facilities and the Olympic village. Hotels, restaurants and bars face a partial ban, with smoking and no-smoking areas required. The rules expand restrictions first introduced in 1995 to include health clubs, museums, ancient temples and government offices. 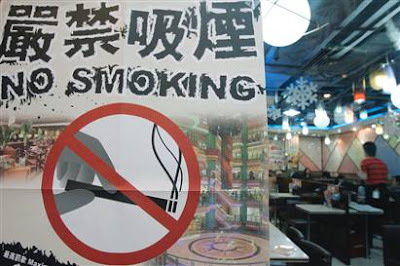 Its a great milestone for China though many of the non smokers here would had prefered that the smoking ban be applied nationwide. Most Chinese smokers can be so insensitive and unreasonable as they take no step whatsoever to consider the surrounding when lighting up their cigarettes. The government should take stricter measures in the nearest future to ban smoking in all public areas and to provide greater awareness to the danger of smoking. Lung cancer is the No.1 killer in China and people ought to know this and take the necessary step to quit once and for all. New UI on Nokia S60?